don’t know why it took me so long to make this as it combines the only two things I ever want when I’m sick: chicken noodle and wonton soup. 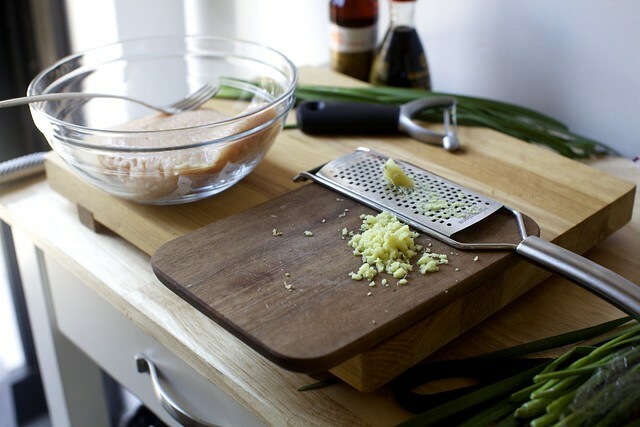 The thing is, when you’re sick, you absolutely do not want to cook anything. (Also sometimes when we’re well, to be completely honest. Shh, don’t tell anyone.) And so for a couple nights, we picked up a decent chicken noodle soup in the neighborhood, but when we tired of that, ordered wonton soup instead. It’s usually a disappointment. 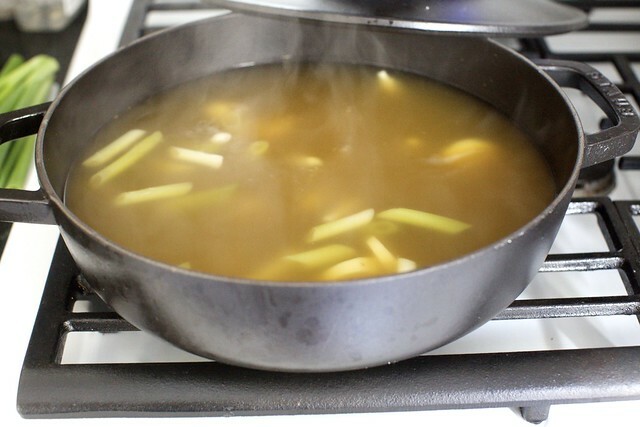 Sometimes it seems like a quart of bland broth with three floating pockets in it, not the most filling meal. Plus, it’s off the menu for anyone who doesn’t eat pork or shrimp. But this one was not; it was chicken wontons in chicken broth and it was exceptional, the happiest mashup of the two wonderful things. Had the delivery not come an hour later, forcing me to — gasp! — scramble some food together for the kids anyway, I probably would have never made this. But as I was enjoying my soup, I realized that this would be so ridiculously easy to hack, it might even be done before it arrived next time. I did make it as soup here, but I also need to tell you that my favorite way to eat wontons when we’re not sniffling and sneezing is Sichuan-style, in chili oil with soy and garlic. Slippery, hot, salty and savory at once, there’s almost no going back after trying them once. This recipe from Fuschia Dunlop seems as straightforward as possible; I’d start with the sauce here if making them for the first time. 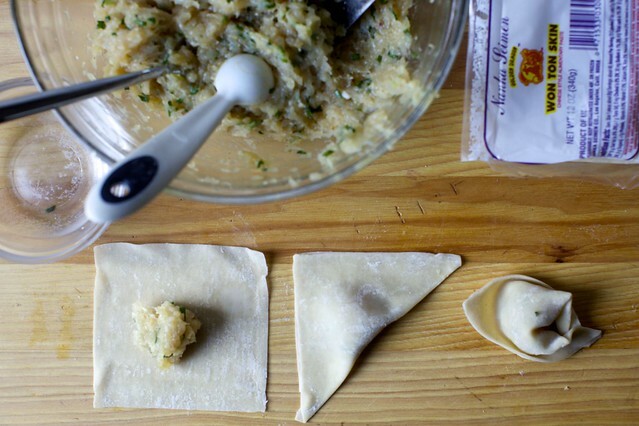 Of all Chinese dumplings, wontons are the simplest to make, if you buy ready-made wrappers. They cook in minutes and have a delightfully slippery mouthfeel. In Sichuan, the source of this recipe, they are known as “folded arms” (chao shou). Some say this is because the raw dumplings look like the folded arms of a person sitting back in relaxation; others that it’s because of the way they are wrapped, with one corner crossed over the other and the two pinched together. 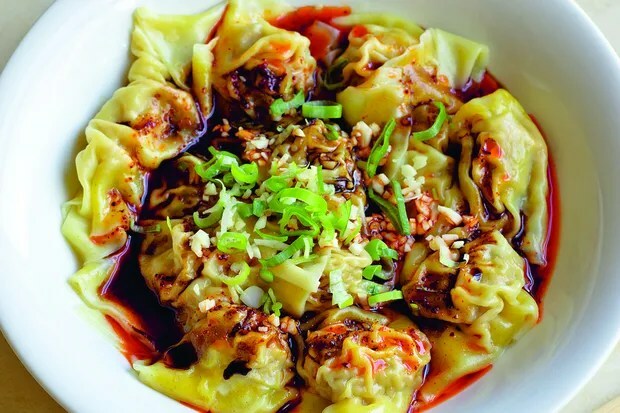 The basic wontons can be served in a host of different ways and this Chengdu version is one of my favorites, with its sumptuous, heart-warming sauce. Wonton skins can be bought fresh or frozen in most Chinese food shops; they should be very thin and supple. If you want to take the easiest option in wrapping the dumplings, you can simply fold them in half, on the diagonal, to make a triangle. Otherwise, wrap into classic “water caltrop” shape, as professional cooks and market vendors do across China. (The water caltrop is an exotic-looking aquatic nut with a pair of horns.) 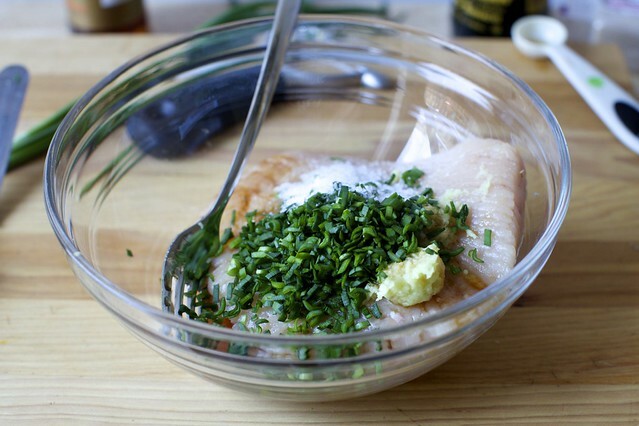 This recipe makes 15-20, enough for four as an appetizer, or two for lunch. If you use fresh ingredients and make more than you need, the surplus can be frozen and cooked straight from the freezer.